very school year, when I was a kid, I would be excited at the chance that this year would be different. I let myself have hope that somehow freshly sharpened new pencils with unsmudged erasers and clean paper in undented folders would change the world. That this would finally be the year that I would feel smart, the bullies would have forgotten about me, and somehow a miracle would have happened, and I would be Popular. Then one year, it finally did happen, for one whole school year. I learned something that year. I knew I was the same as I had always been. I was too stubborn to have become like the popular girls to gain popularity. Later, I would realize the change had come because of the huge party I had thrown in between our freshman and sophomore high school years. I had invited almost the whole class, making sure the popular kids were invited because the boy I had a crush on was part of their crowd. I was not having the party to gain popularity, I was focused on planning to tell the boy how I felt (it did not go well, but that is another story). On the first day of the following school year, suddenly I was recognized as worthy by the Popular Ones, and the bullying stopped. In my puzzlement, I realized I had bought my new status. As I enjoyed my new popularity, I could see with sudden clarity how shallow and unimportant popularity really was. It was then that I understood what adults had been telling me all along: In the long run, popularity in school means nothing. The miracle year ended and so did my popularity, but it no longer mattered. I had realized the side of the room I had come from was so much the richer in texture and experience and that the friends I had there were real. High school and life are not really about who is popular, that is just the faĂ§ade used as a distraction and held in place by those who are too scared to know themselves. Being popular is not the lesson, the lesson is what you learn about yourself and what you choose to do with that knowledge. Too many are so busy maintaining their social status or trying to improve it, that they miss the lesson. High school and college are far behind me now. I have watched as my children chose their paths and I tried to teach them what I had learned. As with most lessons we teach our children, I will Over 100 homes sold in 2017! not know if they it until I Call now for a free market evaluation learned see what they teach their children. 330.241.5370 office In the end, being 440.503.5820 cell brave enough to be Larry Steinbacher yourself and being 3745 Medina Rd, Suite A Broker / Owner Medina, OH kind is all that truly WWW.GREATERCLEVELANDHOMESEARCH.COM matters. VOLUME 1 NUMBER 8 J O Y O F M E D I N A C O U NTY.C OM PUBLISHER Blake House Publishing, LLC E D I TO R Amy Barnes P H O TO G R A P H E R FlashBang Photography A R T D I R E C TOR Ryan Burdzinski C O N T R I B U TO R S Bob Arnold Rich Bailey C. L. Gammon Danielle Litton Paul McHam Kent Von Der Vellen MASCOT Rico Houdini OFFICE 330-461-0589 EMAIL Joy@BlakeHousePublishing.com JOY of MEDINA COUNTY MAGAZINE is published monthly by Blake House Publishing, LLC, 1114 N. Court, #144, Medina, Ohio, 44256. Send change of address cards to above. It is distributed for free in a print edition and as an e-edition that can be found by clicking on Free E-Edition at JoyofMedinaCounty. com. Copyright 2018 by Blake House Publishing, LLC. All rights reserved. Reproduction or use of editorial or pictorial content without written permission is strictly prohibited. Printed in the United States. Any unsolicited materials, manuscripts, artwork, cartoons, or photos will not be returned. Paint and spaghetti, a camel and a birthday, and bees and balloons were found in our camera lens. Devin comes up with an idea that may save the mission from failure. A tasty eggplant recipe to make you fall in love with this common Revolutionary War food. Do you know what a good pre-approval has? Annabelle Stanec competing in the 2015 National Air Rifle Championship. She won first place. Read about the team on Page 4. Wonderful words from competition shooting and last month’s answer key. Stan Nelsen’s love of his sons and shooting competitions led to his becoming a coach for hundreds. ON THE COVER: Dr. Kelly Low’s dream of having a 9/11 memorial has come true, for more pictures, please see Page 8. Several culprits can cause problems in an attic. The name may not be appetizing, but the recipe makes for a hearty family meal. Police officers donate their off-hours time to schoolchildren. Time to grab some adventure and do something new! Even though the Eagles Venture Crew and competition team are based in Ashland, members are from Medina County and the northeast Ohio area. Venture Crews are youth development programs that are part of the Boy Scouts of America. They welcome both boys and girls as members. Nelsen said girls really enjoy shooting with the Venture Crew because there are no special rules for girls. New team member, Emma Bruce, Everyone is treated equally, from Highland High School, shoots a and competition is based bullseye from a standing position. solely on shooting ability. “Kids’ chemical Nelsen, who has a Level 3 rating dependencies at that age in the National Rifle Association’s are perfume and gasoline,” said coaching program. Nelsen, with a deep chuckle. He When his sons, Stanley and added that the shooting team helps Brian, wanted to join a rifle team, teenagers learn to focus and gives he was happy to accommodate them goals to accomplish. them. He helped them join the The club usually utilizes the Ashland Eagles Junior Rifle Venture gun ranges at the Hill N Dale Club, Crew. 3605 Poe Road, Medina, and the His sons’ interest in competitive University of Akron. With UA’s range shooting rekindled his interest, and under renovation, the team has that was when he became a highbeen using the Ashland Lake Gun power service rifle competitor at Club range as its secondary location. the state and national levels. Compressed air is used in the Little did he know he still would team’s rifles in place of gunpowder. be coaching young shooters to The team has a scuba tank they success 30 years later. It was during use for refills. Before acquiring the that time, he moved from Medina scuba tank, rifles had to be filled by to Polk. pumping. a national championship, and her younger sister Annabelle Stanec who was ninth out of 385 shooters in the Civilian Marksmanship Program national competition last June. Annabelle also was awarded a scholarship based on her shooting abilities to The Ohio State University. The team as a whole scored as the 18th highest in the same competition. Continuing the Nelsen family tradition, Caleb Nelsen, Stan Nelsen’s grandson, took silver in an American Legion shooting match. Among other top Eagles competitors were April Engle and Christine Holden. While April Engle was a member of the Eagles’ competition team, she was sent to the Olympic Training Center four times. She has been named as one of the National Rifle Association’s Top 50 Women in shooting competition. She also was on the shooting team for Akron University. Christine Holden was a part of the Eagles team and went on to win the National Standing Air Rifle Championship two years in a row. She currently assists Nelsen with the Eagles team. ABOVE: In 2015, the team won first at the NRA National Air Rifle Championship. Team members, from left, are Antonio Remedios, Annabelle Stanec, Josh Kovach, and Chrissey Holden. RIGHT: A winning team, from left, Coach Stan Nelsen, Annabelle Stanec, Chrissey Holden, Josh Kovach, and Antonio Remedios. Photos provided. Each year, the American Legion sponsors matches to pick young shooters to send to the Olympic Training Center where the shooters will compete to be included in the Junior Olympic National Championship Rifle Match where potential USA Olympic team shooters are identified. Chief Range Officer Gary Antill has been with the group for approximately 25 years. He works with the teenagers who are new to shooting and teaches them safe handling of guns and the rules of competitive shooting. After Antill teaches the new arrivals the fundamentals of shooting, they then work with Nelsen for further training. Nelsen also schedules matches for the young shooters. Typically, Nelsen says, the group participates in two competitive matches a month. He limits the number of monthly matches because competing in the matches is exhausting for the teenagers. “It puts a real drain on them,” he said. Parents form car pools or convoys to transport their teenagers to competitions. His highness, Charlie the camel, recently celebrated his 10th birthday at Spring Mist Farms in Brunswick. Charlie the camel welcomes visitors to his birthday party. Iyliah Jacobson, 8 years old, is sporting the beeâ&#x20AC;&#x2122;s knees in nail art. Left to right, Emma and Charlotte Lees, 21-month-old twins, and Micki Parr, their nanny, lend their artistic hands. Brunswick Library personnel bravely covered tables in white paper, flipped them on their sides, and invited children to use paint-dipped spaghetti noodles and stamps to decorate the paper. Two-year-old Emerson Sholtis perfected a recipe of blue and yellow paints and cooked spaghetti. The Medina Library Bee Festival celebrated bees in many forms, while Medina County Beekeepers Association members were present to answer questions and encourage a love of bees. Three-year-old Xavier Jacobson stretches toward MCBA volunteer Lynette Horn for his bee nails. Peggy Garnes, MCBA member, shares her beekeeping knowledge with festival attendees. Bee Festival crafts were made fashionable by 6-year-old Megan Kolecki, 11-yearold Nicole Kolecki, and 10-year-old Jenna Wyatt. Buzzing with balloons at the Bee Festival. Retired U.S. Army Master Sergeant 30-year veteran Jerry Gardner, daughter Kristina Svancara, and grandson Frankie Svancara pay their respects. James Pittis watches as Janet Pavlic hushes her dog, Sadie. Pavlic is a member of Sons and Daughters of Pearl Harbor Survivors and tries to attend events honoring the military and first responders. MEMORIAL MEDINA, OHIO The Medina 9/11 Memorial, located at Fire Station 1, 300 W. Reagan Parkway, Medina, features a beam section from one of the New York World Trade Center towers destroyed by a terrorist attack on September 11, 2001. Dr. Kelly Low was the driving force behind getting the beam section for Medinaâ&#x20AC;&#x2122;s memorial, and the Medina Evening Rotary Club funded the construction cost of approximately $75,000. Chatting with ceremony attendees are Ohio State Highway Patrolman Sergeant William Lee, left, and Chris Spence, middle, who served together in the 1st Special Forces Group Airborne. Left to right, Medina Fire Chief Robert Painter; Tom Csanyi, #1 Landscaping owner; Dr. Kelly Low, who was integral in getting the Twin Tower beam section for the memorial; retired Master Sergeant Chris Spence, 5th Special Forces Group Airborne who was part of the military response to 9/11; and Medina Mayor Dennis Hanwell. Become a volunteer tutor or work at one of our BookShelf locations in Medina County. Books and other materials are always needed at Project: LEARN or The BookShelf locations. Purchase books at one of our three locations or through Amazon.comâ&#x20AC;&#x2122;s Smile Program! glared back. I stayed out of it. These were the two people I knew I could count on, the two people I knew I needed, and a bit of banter between them was fine with me if that’s what it took for them to get along. “Good afternoon, sirs. Madame,” the receptionist said, as we walked up. She smiled a fake smile with her fake eyelashes, and I found myself missing the one that we had checked in with the night before. This one seemed like all she wanted was for us to leave. “Afternoon. I was wondering if you could help us out. We’re trying to find someone, but London is a big city and we don’t have even the slightest clue of where to begin,” Devin said politely, while the receptionist looked at him uninterestedly. She smiled like a snake looking at a rat with a broken foot and stuck her hand out. “Hm, well I don’t know many people, but I might be able to help,” she said, her eyes widening slightly. “Oh really? If you could help at all, we’d be very grateful.” She smiled like a snake looking at a rat with a broken foot and stuck her hand out. “Well, nothing comes free,” she said. Marissa and I looked at each other, wondering what would happen next, but after a beat, Devin pulled out his wallet and put a five-dollar bill into the snake’s, I mean, woman’s hand. “And what am I supposed to do with this?” she asked, looking like she was about to spit at us. We’d forgotten to get our cash exchanged for pounds, and now it looked like this would cause us to have no starting point for our search whatsoever. “Excuse me,” a noticeably stout man said, approaching from behind us, seemingly out of nowhere. He handed the mean receptionist a few pounds and then looked expectantly at her. She pocketed the cash quickly and then looked up at us. “I would go downtown. West of here. You should be able to get better information about their whereabouts there.” “That’s it?” the mystery man asked her. She shied away, but he didn’t push it. There was no point in fighting a snake to the death just because it bit off your tail. “I’m sorry, kids. Who are you looking for anyway?” Marissa and Devin turned toward me, and he followed their gaze. I didn’t really want to tell him whom we were looking for, but with so much sudden pressure, I gave in. “My mom. Her name’s Lilith,” I said, clenching my teeth before finishing, “Lilith Collette. Do you know her?” “Can’t say that I do,” he said, shaking his head sadly. “Lilith Kizinsky, maybe?” Marissa asked, trying to be helpful. Hearing the name stung. “No, I don’t know any Lilith. Sorry,” he replied, looking sincere that he was feeling bad that he couldn’t help us. This man and the receptionist were on two completely different sides of the spectrum of Londoners. It was an odd contrast to run into on our first full day in the city. He wished us luck, gave us 10 pounds from his own pocket, telling us that he would be fine without it, and went on his way. “Well, it looks like we only have one move to make,” said Devin, after the man left and we had stepped outside. He looked around to get his bearings, then turned toward the west and gestured in that general direction. c on t i n u e d f ro m P a g e 11 “I guess we’ll just go west until we need to stop and then ask around for information again. Someone in this city has to know where your mom lives.” I looked around at the grand city of London and wondered if we’d ever find the Collettes. Until just then, I hadn’t thought of how not finding them was a real possibility. It scared and upset me, but I still had Devin, I still had my girlfriend, and whether we found my family or not, we’d still have each other. And I was OK with that. plied. “Cool,” I said, heading for the doors. We walked in and found that the inside was just as fancy as the outside. Luckily, they took credit, and Devin paid for the lunch. We ordered, sat down, and dug in. The food was delicious, much better than airline or hotel food. As we ate, we discussed a few ideas of how to find the Collettes, but none of them were very viable. Devin even asked the waiter, but he just laughed at us and said, “How should I know?” We finished lunch and left the restaurant, still with our luggage in tow. It was awkward, and we really needed a place to sit and figure out what the next step was, so Devin pulled up a map on his phone and did some searching. accurately, our lack of options. “The city’s too big,” Marissa said after almost two hours. Even she was getting discouraged. Suddenly, a woman walking her dog a few feet away perked up and asked, “Too big for what, dearie?” Marissa looked back at her hesitantly, then back at Devin and me, and then back to the woman. “Too big to find someone we’re looking for.” “Oh, that can’t be true. Everyone’s around here somewhere. Who are you looking for?” Marissa and Devin turned to me expectantly. “Um…Lilith. Lilith Collette,” I said. “Hmm, the name doesn’t ring a bell, but don’t give up! I’d try restaurants and pubs. Everyone comes around to them once in a while,” the woman replied. “OK, thanks,” I said, half-heartedly. I was grateful she had tried to help, but at the end of the day, she just wasted our time. We already knew asking around in popular places wasn’t a bad idea. We needed something more concrete. The woman nodded and walked off with her dog leading her away. I turned to Marissa, hopeless. “Now what?” “I guess we listen to her.” Marissa frowned a bit, grabbed my hand, and squeezed gently. “We can try nearby restaurants, slowly moving downtown, asking everyone who’ll give us the time of day if they know her. It’ll be tedious and irritating, but someone, somewhere, has to know of your mom,” Devin said. He looked serious, and I was beginning to realize that he wasn’t going to let us give up that easily. We came to London for a reason, and Devin wasn’t leaving until we found her. “Can we even get into pubs, though? We’re still minors,” Marissa pointed out. idea for that,” Devin said, pointing at a few schoolboys playing Frisbee in the park. “Perfect! I’ll go ask them!” Marissa said, heading off in their direction before Devin could stop her. He chuckled in response and turned toward me, “We’ll see how far she gets without this.” He waved the 10-pound bill in front of my face, laughing at Marissa’s foolishness. He quickly stuffed it back in his pocket as she returned. “Hey guys! School’s that way,” Marissa said, pointing. Devin’s jaw dropped. “There’s no way you got that out of teenage boys without paying them. I know teenage boys, and they like to get money out of people.” “They also like girls,” Marissa said, giggling, while she grabbed her luggage and walked off. Devin looked at me for some sort of reassurance, but I just shrugged, smirked, and stood from the bench to follow Marissa to the school. Our st ory cont inu es next mont h! Christopher Barnes is a graduate of Medina High School/Medina County Career Center and The Ohio State University. Find his stories of realistic fiction and magical realism at http://cbthesurvivor. Wash, peel and slice eggplant. Sprinkle generously with salt. Allow to sit for 30 minutes. Rinse and pat dry. Set out two shallow dishes or trays. Pie pans work well. In the first tray, add bread crumbs, half of the parsley, half of the cheese, and garlic and onion powders. Eggplant was brought to England from Egypt and was then brought to America. At that time, eggplants produced small, round white or yellowish fruits that looked like eggs, unlike the large purple oblong fruit seen in today’s grocery stores. In the second tray, beat the eggs with a fork. Add the remaining cheese and parsley. Dip the eggplant into the egg mixture, turn to coat both sides. Dip and coat both sides in the bread crumb mixture. Heat a pan with a quarter inch of olive oil. Add the garlic in whole pieces. As the oil toasts the garlic, mash it with a fork to flavor the oil. Remove before browning. Fry in hot olive oil over medium-high heat for five to 10 minutes or until golden on both sides and is tender in the center. Serve as is, season to taste with salt and pepper. cont inued f rom Page 5, CALLING THE SHOTS The rifle team is a four-year program. When young shooters being the program they are 14 years old, when they finish the program, they usually also are graduating from high school. There have been exceptions made for a few extraordinary 10 -year-olds, who were allowed to join the club. Dues are $175 and includes ammo, targets, shooting jackets, and guns. The ammo costs from $135 a case to $250 a case, with each case holding 5,000 rounds. Approximately 600 rounds are used per match. Nelsen ensures team members get as much value as possible from their dues, and he wants to spare parents the equipment costs in case students decide they are not interested in shooting. “We don’t recommend that, in the beginning, they buy the equipment, to be sure the kids are really into it,” Nelsen said. Nelsen is looking for new shooters to turn into champions. Currently, there are 10 members of the Eagles and two members on the competition team. Two more are needed for a complete competition team. When prospective team members show an interest in joining the Eagles, they are asked to attend a club practice at the Hill N Dale Club, 3605 Poe Road, Medina, on a Monday night to meet the other club members and Nelsen and to ensure that the shooting club is a good fit for them. Those interested in joining the Eagles can contact Stan Nelsen at snelsen223@yahoo.com. When someone says, “Thank you,” do not say “No problem.” It lessens the value of the thank you. Instead, say, “You’re welcome!” so they know you appreciate the gift of the thank you. Standing on stage in Nashville, the lights dimmed around me, and the crowd got still as the music to “Rocky Top” started to play. I took a deep breath and, right on cue, belted out, “Wish that I was on ol’ Rocky Top down in the Tennessee hills.” The crowd went wild! At least that is how I remember it. Now, it may have taken some encouragement from my friends to get on stage and sing karaoke in the Country Music Capital of the World, but in that time, outside of my comfort zone, I truly realized how good it feels to let go of fears and enjoy the moment! Nashville is one of my favorite cities because of the live music and entertainment, boating on the river, delicious bushwhackers (adult milkshakes), a plethora of food choices, honky-tonks and karaoke bars on Broadway, minor league baseball games, and the country music history. However, celebrating one of my best friend’s 30th birthday was the purpose of this trip and it showed me that no matter how awesome a place already is, enjoying it with the ones we love makes it magical. Do not be scared to get on stage and sing a little karaoke, even if you do not like country music. Experience the honky-tonks on Broadway. If you drink a bushwhacker, drink only one. Visit Centennial Park to see a full-scale replica of the Parthenon in Athens, and most of all: Do not grow up, it is a trap. Where do you look for mold? Let us start at the top this month and work our way down in the months to follow. The attic is the second most common place to find mold, usually due to ventilation issues. Attic mold is seldom considered a health issue because, unless it is a converted attic space with “knee walls,” excess spore will exit the attic with the ventilation. This assumes that ventilation is adequate. If ventilation has not been adequate, it is too late, and discoloration already exists. This discoloration ranges from black to white and is mold caused by water. The reasons for water in an attic can be caused by roof leaks from chimney flashing going bad; shingles rolling up as they deteriorate; lack of an ice and water shield membrane; a missing drip edge; old nails loosening and allowing water through; and much more. Water in an attic also can be caused by water vapor condensing on the roof deck, maybe freezing in the cold months, and growing mold as it melts. Proper ventilation avoids this. The best attic ventilation is to have adequate soffit ventilation and a ridge vent. Allowing the air to flow over the roof deck, absorb the moisture, and exit through the ridge vent, where it can condense harmlessly. Any gable vents or static vents should be blocked with quarter-inch plywood. Ridge ventilation can be cut as wide as possible to allow for adequate airflow. Bathroom exhausts should be vented separately, not connected to each other, and each should go out through the roof or the end gable wall, not to the soffit area where the moist air could re-enter the attic at a perforated soffit down the line. Perforated soffit vents should be free of insulation and the wood behind it should be cut out to allow airflow. Occasionally, felt paper is lapped over the top of a ridge vent and remained because someone forgot to cut it out. This is at least a start on looking for mold and removing the causes of it in your home! Paul McHam is a local expert on mold remediation. For more information, visit his website at http://myairxperts.com/ and his Facebook page Moldsporewars http://bit.ly/2E2Fj3y or call 330-331-7500. BI T E M E ! Back in the seventies, my mother was a divorced schoolteacher in a very small Oklahoma town. At that time, Hamburger Helper was all the rage. Working moms found it to be a quick and easy alternative to cooking meals from scratch. The problem for our family was that I was a very hungry teenager who was having lots of painful growth spurts. My mother had to figure out a cheaper alternative to the boxed, pre-measured meal that realistically had barely enough for two people, much less four. Mother looked at the ingredients used in Hamburger Helper and decided it was much more economical to make it from scratch and with a much higher yield, so everyone had all they could eat. No one dared to point out the irony in her taking a convenience food and taking it backward to a from-scratch version. It wasn’t long before we were eating Hamburger Glop or Tuna Glop at least once a week. Why the name Glop? Because, as my mother said, that was the sound it made when it hit the plate. You had to have a sense of humor to survive on our farm. TIP FROM A PLUMBER: When pouring boiling water down the drain, run cold water from the faucet at the same time to avoid the drain pipe coming apart. It also helps to decrease the steam. Add noodles to boiling water in large pot. When the noodles are almost cooked, add peas. Cook until noodles are tender and peas are hot. Drain off water. Add meat mixture and combine. Tuna version: Replace beef with two well-drained cans of tuna. Eliminate onion soup and mushrooms. Follow directions for Hamburger Glop. Let's do it! Saturday, September 1 Emma Nutt Day https://bit.ly/2LKPdtH 9 a.m. to noon. Migratory Bird Banding; Wolf Creek Environmental Center, 6100 Ridge Road, Wadsworth. Dependent on weather. All ages. Learn about bird banding. 11 a.m. to 3 p.m. Knitting and Crocheting Circle; Highland Library, 4160 Ridge Road, Medina. Beginners welcome. Making Warm Up Medina County donations. Monday, September 3 Skyscraper Day https://bit.ly/2tJRg7r Libraries closed for Labor Day. Wednesday, September 5 Be Late for Something Day https://bit.ly/2tfvTXR 10 a.m. to 11 a.m. Natural Discoveries Program: Nature Through the Seasons; River Styx Park, 8200 River Styx Road, Wadsworth. Ages 7 and up. No registration. Free. Monday, September 10 Swap Ideas Day https://bit.ly/2v7p5ie 7 p.m. to 8 p.m. Veterans Roundtable; Medina Library, Community Rooms A and B, 210 S.
Joy of Medina County Magazine | September 2018 Broadway Street, Medina. Veterans’ stories of survival with Carl Bilski, U.S. Army. All Ages. No registration. 10 a.m. to 11 a.m. or 1 p.m. to 2 p.m. Creative Concoctions for Preschoolers; Letha House Park West, 5800 Richman Road, Chatham. Mysterious mixtures and marvelous messes. All supplies provided, come dressed for mess. Free. Ages 3 to 6. Register at https://bit.ly/2w6Exf0 for 10 a.m and at https://bit.ly/2MIUvDa for 1 p.m.
10 a.m. to noon. Brunswick Library: Knitting and Crocheting Circle; Highland Library, 4160 Ridge Road, Medina. Beginners welcome. Making Warm Up Medina County donations. 11 a.m. to 3 p.m. Monarch Tagging; Wolf Creek Environmental Center, 6100 Ridge Road, Wadsworth. Help catch and tag Monarch butterflies before they leave for Mexico. Nets available. Naturalist on hand. All ages. Free. No registration. 9 a.m. to noon. Migratory Bird Banding; Wolf Creek Environmental Center, 6100 Ridge Road, Wadsworth. Dependent on weather. All ages. Learn about bird banding. Noon to 5 p.m. Wiggly, Wonderful Worms; Susan Hambley Nature Center, 1473 Parschen Boulevard, Brunswick. All ages. Free. 2 p.m. to 7 p.m. American Red Cross Blood Drive; Root Candles, 640 W. Liberty Street, Medina. http://www.redcross.org/local/ohio/ northeast 6:30 p.m. to 8:30 p.m. Making Your Money Grow; Medina Library, 210 S. Broadway Street, Medina. Hosted by OSU Extension. Topics include net worth, investing, helpful hacks. Pre-registration is encouraged. Registration is $10 per person, due by September 10. Send to: OSU Extension Office, Medina County, 120 W. Washington Street, Suite 1L, Medina. Thursday, September 13 Defy Superstition Day https://bit.ly/2NMni9N and Positive Thinking Day https://bit.ly/VH6Qwi and Roald Dahl Day https://bit.ly/2tfHTsv 1 p.m. to 2 p.m. Score Some Points: Understanding and Raising Your Credit Score; Recovery Center of Medina County, 538 W. Liberty Street, Medina. One-toone sessions on how to raise credit score, differences between good and bad credit and how it affects credit scores. 12:30 p.m. to 4:30 p.m. Medina County Park District: Northern Ohio Live Steamers, All Aboard! Miniature Train Rides, Lester Rail Trail, 3654 Lester Road, Medina. All ages. Free. No registration. 9 p.m. to 11 p.m. Medina County Park District and Cuyahoga Astronomical Association: Starry, Starry Nights; Letha House Park West, 5800 Richman Road, Chatham Township. Use association telescopes to view deep-sky objects, observatory open, activities and displays in barn on cloudy nights. Questions welcomed. All ages. Free. No registration, first come, first served. Joy of Medina County Magazine | September 2018 9 a.m. Medina Runs Down Cancer: Race With Grace 5k and Fun Walk; Medina Hospital, 1000 E. Washington Street, Medina. https://bit. ly/2KMOunq Noon to 5 p.m. Wiggly, Wonderful Worms; Susan Hambley Nature Center, 1473 Parschen Boulevard, Brunswick. All ages. Free. 3 p.m. to 4 p.m. Natural Discoveries Hiking Series: Caterpillars and Cocoons; Hidden Hollow Camp, 8672 Richman Road, Lodi. Search for and learn about caterpillars and their cozy winter homes. Award-based hiking program. Free. Ages 7 to adult. No registration. Monday, September 17 National Apple Dumpling Day https://bit. ly/1wDj0Gx 1 p.m. to 7 p.m. American Red Cross Blood Drive; Seville United Methodist Church, 74 W. Main Street, Seville. http://www.redcross.org/ local/ohio/northeast 1 p.m. to 7 p.m. American Red Cross Blood Drive; Brunswick United Methodist Church, 1395 Pearl Road, Brunswick. http://www.redcross.org/local/ohio/northeast 6 p.m. to 8:30 p.m. Quilting for Warm Up Medina County; Sew Much Happens, 445 W. Liberty Street, Suite 223, Medina. Bring 100-percent cotton fabric. Bring machine, if possible. Learn how to sew for free while making quilts for those in need. For more information, call 330648-3335. Friday, September 21 Miniature Golf Day https://bit.ly/1MlYXSv and World Gratitude Day https://bit.ly/1tvFy7m (We are thankful for miniature golf, especially if there is a windmill on the course.) 5:30 p.m. to 10 p.m. Bluegrass Jam and Dinner; Lafayette United Methodist Church, 6201 Lafayette Road, Medina. Kitchen opens at 5:30 p.m., music starts at 7 p.m. Donation admission $3, dinner is additional donation request. Bring favorite dessert to share. Bluegrass bands welcome, arrive early to be scheduled. Monday, September 24 Punctuation Day (a favorite of our magazine publisher’s!) https://bit.ly/2wf5xLD 2:30 p.m. to 4 p.m. Movie Monday! Buckeye Community Room, Buckeye Library, 6625 Wolff Road, Medina. Popcorn, pillows, movie. Grade levels 6 and up. Free. No registration. Tuesday, September 25 National Comic Book Day https://bit.ly/2NJr04b 10 a.m. to noon. Brunswick Library: Knitting and Crocheting Circle; Hickory Room, Brunswick Library, 3649 Center Road, Brunswick. Beginners welcome. Making Warm Up Medina County donations. 9 a.m. to 10 a.m. Medina County Park District: Healthy Strides; Lake Medina, State Route 18, Medina. Physician talk and one- to three-mile walk. Ages 10 and up. Free. No registration. 10:30 p.m. to 11:30 p.m. Get to Know Your Parks…Letha House! 5800 Richman Road, Spencer. All ages. Free. 7 p.m. to 8 p.m. Music at The Lodge: Gretchen Pleuss; Lodge at Allardale, 141 Remsen Road, Medina. Bluegrass, gospel, Americana music. Free. 7 p.m. to 8 p.m. Raptor ID; Wolf Creek Environmental Center, 6100 Ridge Road, Wadsworth. Learn about local raptor species and how to identify them. Presented by the Medina Raptor Center and guests. Ages 7 and up. Free. 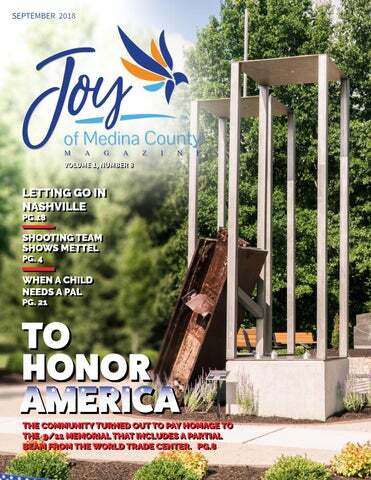 Joy of Medina County Magazine | September 2018 Lafayette Road, Medina. Kitchen opens at 5:30 p.m., music starts at 7 p.m. Donation admission $3, dinner is additional donation request. Bring favorite dessert to share. Bluegrass bands welcome, arrive early to be scheduled. Saturday, September 29 Confucius Day https://bit.ly/2vHChf2 9 a.m. to noon. Migratory Bird Banding; Wolf Creek Environmental Center, 6100 Ridge Road, Wadsworth. Dependent on weather. All ages. Learn about bird banding. 11 a.m. to 3 p.m. Knitting and Crocheting Circle; Highland Library, 4160 Ridge Road, Medina. Beginners welcome. Making Warm Up Medina County donations. 11 a.m. to 4 p.m. American Red Cross Blood Drive; Lodi Library, 635 Wooster Street, Lodi. http://www.redcross.org/local/ohio/northeast 2 p.m. to 3 p.m. Search for Snakes; Allardale West parking lot, 401 Remsen Road, Medina. All ages. Free. 5 p.m. to 8 p.m. Bankers and Brews Beer Tasting; historic Phillips-McDowell House, corner of Blake and Prospect in Medina. Includes 4 tastings, one pint, tasting glass, food, entertainment. Tickets, $35 at Cool Beans or e-mail jksimmons@zoominternet.net. Benefits Bankers Row Historic Corridor Neighborhood. 6:45 p.m. to 10 p.m. ORMACO: Moâ&#x20AC;&#x2122; Mojo: An Evening of Zydeco Music; Wadsworth Senior High School, 625 Broad Street, Wadsworth. All are invited for a Zydeco dance lesson on stage, 6:45 p.m. to 7:30 p.m. Music is 8 p.m. to 10 p.m. Tickets $20 at Buehlerâ&#x20AC;&#x2122;s grocery stores beginning August 27 or at https://bit.ly/2v5cyM9 Tickets at the door, $25 (cash or checks, only). SWING FOR IT! Submitting Calendar Events A list of golf outings that benefit area non-profit organizations. To have your golf outing listed, send the information to joy@blakehousepublishing.com at least two months in advance. There is no such thing as too early but there is too late. “Let’s Do It!” is a calendar of events sponsored or hosted by non-political, non-profit groups in Medina County. The calendar also is available online at JoyofMedinaCounty. com, where it is regularly updated with additional events. There is no charge to list an event in the calendar. To have an event listed, please send date, time, event name, location, cost of event, organization benefitting from the event (and hosting or sponsoring organization if different), contact name and phone number, website if available, and name and phone number of the person submitting the information to joy@BlakeHousePublishing. 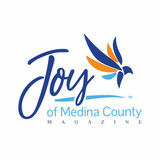 com with Calendar in the subject line or you can mail the information to Attn: Calendar, Joy of Medina County Magazine, 1114 N. Court, #144, Medina, Oh. 44256. Calendar information will not be taken by phone. The Chippewa Lake Water Ski Show Team waves goodbye to summer. Top row, from left, Melissa Ford, Natalie Bailey, Nikki Lee, Jenny Peshina, Brooke Lee, Morgan Lee, Grace Goldsberry, Paige Peshina. Bottom row, from left, Rich Esber, Nick Bailey, Mark Ford, Nick Timura, Bryan Midlik, Doug Peshina, Bill Lee, Doug Ribley. Medina 9/11 Memorial, a championship shooting team, schoolchildren find PALS, and much more!